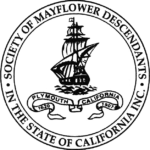 SAN DIEGO COLONY MEETINGS – Our Colony gathers at least three times a year for a luncheon and program. A member or guest speaker often provides a discussion of topics related to the Pilgrims or American History. In November, we hold our annual Compact Day Program and Luncheon. Additional trips or outings may be planned that may be of special interest. This meeting celebrates Pilgrim Compact Day and is scheduled for the GREEN DRAGON Tavern & Museum in Carlsbad. The address is: 6115 Paseo Del Norte, Carlsbad, CA. Watch your email for the Luncheon Reservation Form. **PLEASE NOTE** that due to count requirements by the Green Dragon, the completed Reservation Form and Payment must be received by our Colony Treasurer no later than Wednesday, November 7th. HOPE TO SEE YOU THERE! Plan to join us at the House of England cottage in San Diego’s Balboa Park for an informative and fun day. Learn about the Pilgrim’s motivations and struggles in seeking a new home in a strange new land. Meet and learn from experienced genealogists how to get started in discovering if you are one of their millions of descendants.